Why Do I Have Brown Patches in My Yard? We have measured 7.66 inches in the Caldwell Extension Center rain gauge since May 16. I know some in the county have measured even more than that, but we can all agree we’ve had a lot of rain lately. I was asked this week “it has rained so much that a low-lying part of my yard is turning yellow. They say to treat it, but how with all the rain?”. Here are my thoughts to answer this question. Yellowing can occur when there is a problem with the root system. Extended periods of standing water (soil saturation) damage the roots because they can not get oxygen. When the roots are stressed, the entire plant is affected and the leaves will turn yellow or off-colored. However, tall fescue withstands periods of soil saturation better than many grasses. And although we have had excessive rain, I think other plants in the landscape will present issues from saturated soils before tall fescue shows any signs. Japanese maples and leyland cypress trees are two that certainly do not like wet feet, but there are many others too. Brown patch first shows up as tan lesions with a dark border. Soil saturation also increases the leaching potential of soil nutrients. Nitrogen, sulfur, calcium, and magnesium are most at risk for leaching from the root zone in saturated soils. When nitrogen and sulfur are limiting the plants turn yellow. However, these nutritional deficiencies take 10 to 14 days to show in the plant. Also, clay soils are much better at retaining nutrients than sandy soils. Caldwell County soils are predominantly clay and thus less likely to have leaching problems as compared to soils on the eastern side of the State. However, if you suspect leaching is an issue, take a soil test so lost nutrients can be replaced. Soil samples are analyzed at no-cost until the end of November, then there is a $4.00 charge per sample. Plant diseases can affect different parts of the plant. Diseases that affect the leaves reduce the plant’s green color. 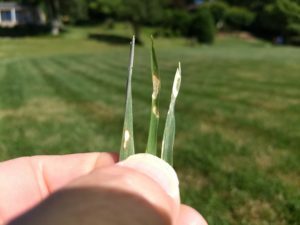 Typically turf leaf diseases cause the leaves to change color from green to yellow then tan, brown, or red. Universally, leaf diseases need moisture to infect the plant. So all our wet weather has greatly increased the disease potential. All of the turf problems I have looked at over the last week or so are all disease related. Brown patch is the biggest problem I’ve seen in tall fescue. I have also seen a red thread issue too. Red thread is named because the fungus is actually red and grows out of the infected leaf. This gives the spots in the lawn a pinkish color. Both of these diseases need extended periods of leaf wetness and warm conditions to get started. 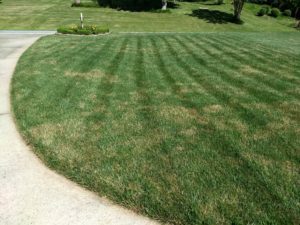 Brown patch can become active when nighttime temperatures are above 60 degrees Fahrenheit. Brown spots for patches are very diagnostic of the disease brown patch in tall fescue. mowing at 3.5 to 4 inches high. If brown patch is still a problem consider making two or three preventative fungicide applications starting in mid-May. For preventative applications select a strobilurin class of fungicides. These give the best results because they are effective over 28 days and have a broad spectrum of diseases they prevent. However, fungicides are not a magic bullet. Don’t use these products to cover up poor cultural practices. 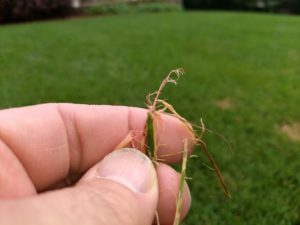 If you have a disease issue in your lawn bag the clippings if you can. This will reduce the inoculum and the spread of the disease. Also clean the mower with compressed air, a leaf blower, or water hose. For answers to your agricultural questions, call the Caldwell County Extension Center at 828-757-1290, or visit us online anytime at //caldwell.ces.ncsu.edu.